Mariehamnsregattan - Åländska Segelsällskapet r.f. 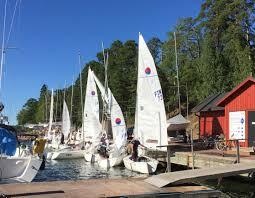 The regatta is sailed Friday through Sunday on Lagneskärsfjärden. We wish you a warm welcome to Mariehamn and ÅSS! The Åland Yacht Club (Åländska Segelsällskapet), founded in 1897, is one of the oldest yacht clubs in Finland. The club resides in the Western Harbour of Mariehamn where the club has its main marina. This is also where the regatta base will be located. The waters nearby Mariehamn, the capital of the Åland islands district, are in the archipelago both exciting and challenging. The dominating wind direction in the summer is from south to south-west. The velocity of wind has a variation from 0 to over 30 knots. In order to obtain a space for your car and trailer on the ferry of your choice during our summer high season, please be sure to book well in advance.